Allonne looked friendlier in the morning, but the cold was still boring us to the bones. This photo was taken seconds before my phone slipped out of my numb, freezing hands. It now has a permanent dent, which makes for a memorable souvenir to remind me of this unanticipated (mis)adventure. On the way back from Spain to Paris, we were prepared for another episode of #thehobolife in Beauvais. If we could survive that night, what’s another? We were confident we’d be safe, after learning from our first hobo experience pre-Spain that there is a mosque in Beauvais which we could take shelter. We planned on taking the last bus from Beauvais airport, and alight at the stop where the mosque would be. Unfortunately, we were so engrossed in our conversations that we forgot to keep a lookout. The minute we saw our bus coasting down the highway, we knew we’ve missed our stop. We went up to the bus driver to ask him where we were heading. The scene that greeted us as we dropped off the bus, looked like one right out of an indie flick – we were literally in the middle of nowhere. We were all alone. Half past midnight and we were stuck in a desolate, deserted town. No cars, no houses, and our hopes of being safe for the night began vanishing into a tiny black spot. There were silhouettes of a building, with a flickering sign which says ‘Hotel’, in the distance. It was our only beacon of hope, besides the small KFC across the road, which thankfully, was still brightly lit. We crossed the road and made our way towards it, holding on to the hope that someone could help us out. We ran back to the other side of the road, and walked to the hotel. Apparently there were 3 of them; 2 of which were closed for the night. The only small hotel that was open, was our only hope. We spotted a man, with luggage parked near his feet, standing outside and looking down at his phone. When he saw us approaching, he told us that there were no more rooms available, no one manning the lobby, and it was closed to outsiders for the night. We peered into the empty lobby, and persistently tried to pry the door open, but attempts were all in vain. Suddenly, a man, presumably someone who was staying the night in the hotel, came out to the lobby and was readying himself to head out for a smoke. He held the door open for us, and we scrambled inside, away from the wintry summer night. Merci. Once inside, we plonked ourselves on the hard seats, and tried to get some sleep. Hours came and went, and we finally awoke to the brightening skies, and the hotel staff telling us to leave. We trooped out of the hotel lobby, and into the bitterly cold morning. We walked to the bus stop, and froze in the biting weather while waiting for half an hour for the bus to take us back to Beauvais. It was then that I realized the sign in the picture above, right beside the bus stop. 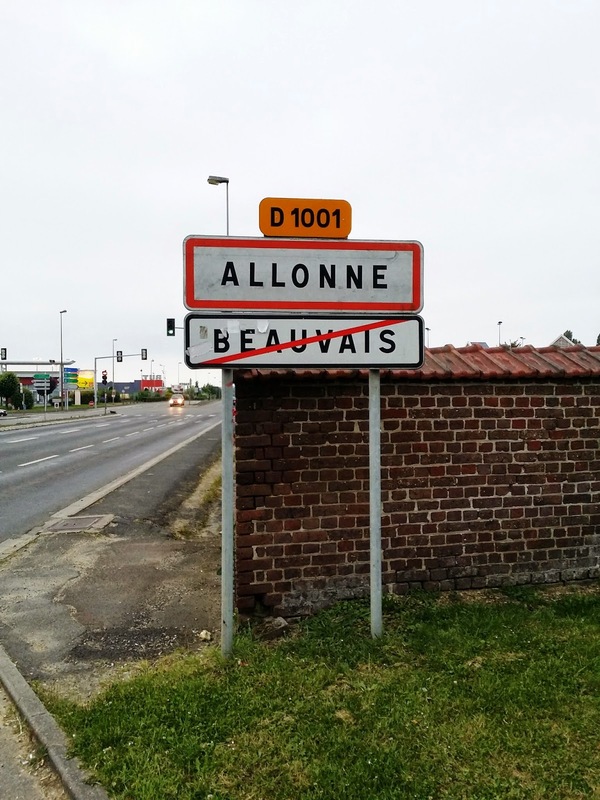 As the morning came, so did our realization that we were at the entrance of another city, demarcated by nothing but a sign – where Beauvais ends & Allone begins. We braved Beauvais, were all alone in Allonne, and all we wanted to do then, was to get back to Troyes, our home. …and study for exams the very next day. Throughout these unforgettable nights of squatting around homeless, I’m thankful to have gone through it all with people who are equally as adventurous, & equally as mad.